Accommodation at Palacio de Rio-Frio. This beautiful Palace dates back to the beginning of the 20th Century. 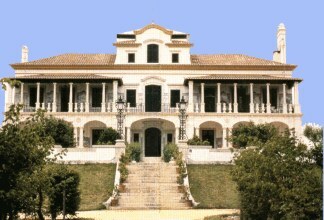 It is located in a small wood in the countryside yet it is only 40 minutes from Lisbon with easy access to the airport. An outstanding house in which to stay and an ideal location from which to impress your business contacts by arranging a meeting in one of the beautiful rooms. 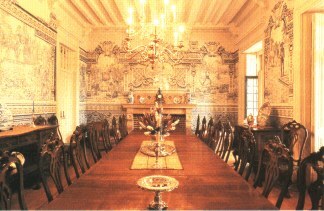 The formal dining room is decorated with agricultural scenes on the famous Portuguese 'Azulejos' - hand painted tiles, the work of Jorge Colaca. 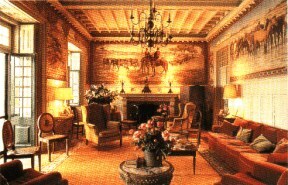 The sitting room has magnificent paintings of horses on the walls. A very appropriate theme since this is the area of Portugal for horses and riding in the countryside. Local places of interest to visit are Palmela with its castle perched on a hilltop and the picturesque village of Alcochete. The fighting of the locally reared bulls takes place at Alcochete. In Portugal the bull is not killed and trots out of the ring with his prize, a harem of cows. The star of the show is on horseback but probably the bravest are the men who enter the ring for the finale and have to wrestle the bull to the ground to subdue it. Nearby are the fabulous beaches of Arrabida and Sesimbra which are in the Natural Park. There are small coves on a south facing coast and may restaurants serving excellent freshly caught fish. Lisbon is best visited by leaving the car on the south of the river and enjoying the ferry ride into the centre of the capital. For the use of guests, there is one suite, two double bedrooms and one single room all of which have en suite bathrooms. Guests also have the use of the dining room and the sitting room. Meals can be arranged by prior arrangement. In the distinguished garden that surrounds the palace there is a swimming pool. Guests at the house can enjoy riding or shooting or simply relax and unwind in the peaceful atmosphere of the house and gardens. We were lucky enough to have the Palacio do Rio Frio to ourselves for two nights in May. We had a bit of trouble finding it, as the directions do not tell you that you have to cross a traffic bridge to get to the old agricultural zone of Rio Frio. With persistence and a bit of luck, we finally found it. We were greeted by Sophia, one of the siblings, who along with their mother,own this fabulous house. 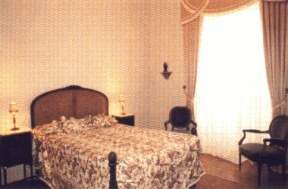 We were given a large and comfortable suite, and had access to a small kitchen, along with the grand dining room, and a number of sitting rooms, all furnished with exquisite antiques. Despite the grandeur, all is very comfortable and we knew we were staying in a much loved home. Sophia and her husband could not do enough for us. They were very kind and considerate. The grounds are very beautiful, and a very nice pool is also available for their guests' use.